HDR panorama of the white cliffs of Etretat. A wonderful place to visit alone, sit, watch and ponder (click to see complete). I know I said I ‘d be back in September but you know life has a habit of taking your plans and placing them in the garbage can without warning or, even worse, saying sorry. Well, some of that happened. Thankfully, it was for the better, so no complaining on my part, but I must apologize to all of you, thousands of readers, that were left stranded after the interlude post XD. I am back, anyway. Probably not with the same pace as before, but I will try to do my best. I think I told you I planned on going on holidays by myself, right? Well, I did. I Left my family at home, took the car and a “2-Seconds” camping tent, and drove to Normandy and back during some 9 days. There are a few things to say about this lone travel. There is definitely something to taking the road by yourself, and the main concepts that come to mind are freedom, peace and silence. I planed the journey I wanted to make, walked through it at the pace I wanted, and changed it on the fly whenever it felt right to me. I liked something? I lingered. I didn’t? I moved on. No time wasted, just free will. I spent 9 days going when and where I wanted and doing exactly what I thought best, right away. Absolute freedom. The second concept is peace. For 9 days, I gave no explanations, had no argument of any kind, had to take care of nobody, no nothing. I was not a father, a husband or a companion, I was just me. All my decisions were instantaneous and right. Even when the decision was not the best, it was still right. Not that I lead a stressful life, or that I am fighting all the time, but the experience is truly peaceful and soothing. The other side of this is that you need to take care of every little aspect of the journey, nobody to lend you a hand, but that was also a pleasure, its own way. And then the silence. I am not talking of the absence of sound, I am talking of the absence of conversation. Specifically, outer conversation. I exchanged a few words with a few people now and then, but when I was visiting I was basically by myself 100% of the time. That outward silence is wonderful for inner conversation and makes for a much more intimate and conscious visit. And that was appropriate. I went to nice touristic places too, bu mainly I visited sites where I wanted to pay my respects and reflect, and chit-chat seemed frivolous and out-of-place. It is not easy to visit certain places properly when you travel with kids. I am not saying it is wrong or that one shouldn’t go with kids to those places, at all, but kids will be kids and that was not the way I wanted to see those places for the first time. I will talk more about this in the following chapter. 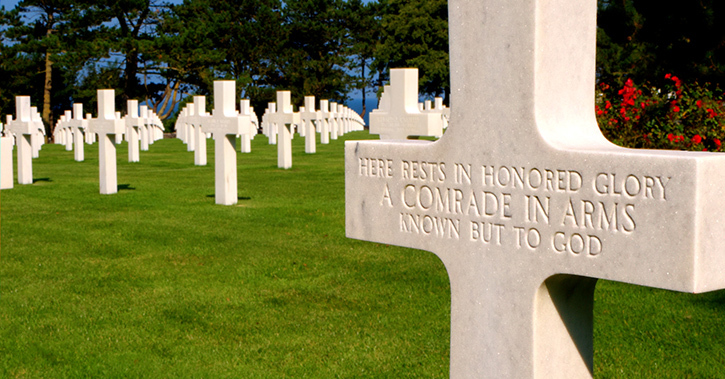 American Cemetery at Omaha Beach. A place best visited alone (click to enlarge). Now, I know all this might sound a little selfish. However, I left on my own out of need, after sacrificing my holidays on behalf of my family for four years in a row (including this very summer). Sometimes, selfish is the right way. Sometimes it is therapeutic and healthy. And furthermore, some places are best visited alone. As i said, I wish I had done this lone travel before. And goes without saying, will do it again. For the first time in my life I could move at my own pace. Obviously my pace is more demanding than that of my whole family. I would get up early, have a strong breakfast, hit the road and spend the whole day away, driving, seeing, walking, learning, thinking and taking pictures, non stop. I would go back in the evening, have dinner, look through the new raw pics, read a little and crash. On the whole, I lost three or four pounds and had to take a morning off the seventh day, but I could have gone on forever. Being on your own allows you to plan things so differently. I would visit places and stay late into the night, or go early (well, not so many on this one to be honest), and something I enjoy but family makes it unfeasible: Relinquish the car at the first chance. I like to run, I like to trek and I like to walk, but you cannot walk long distances with kids and apparel, so you just forget about it. First day of my journey I crossed France from south to north, drove over 9 hours to Mont Saint Michel, set camp and then walked some 12 km, to, from and in this amazing island city. I came back to the camping in the dead of the night, following an empty road under a wonderful crescent and moving away from the edge when a car crossed me because I dress in black and there was no artificial light whatsoever. Got some beautiful pics and it took me well over an hour in the darkness to return to my tent. Walking back from Mont Saint Michel at night. This is an HDR panorama. The sky was actually darker 🙂 (click to enlarge). There is something new about the shots I have been taking from early in the summer and all through the journey to Normandy. I have started shooting HDR panoramic compositions. That means shooting series of HDR images that I later merge into wide panoramas. I suppose lots of people are already doing this, but I have developed this technique on my own and, as far as I know, I might as well be the only one doing it. Haven’t checked if others are doing the same. The Etretat shot is a 4×5 HDR Panorama. That is 5 shots of each of the 4 pieces that form the panorama that can be printed up to 84″ wide. The St Michel image is a 3×5 (60″). The picture from Omaha Cemetery is a detail of this vertical image, also HDR. I did not shoot many pictures in Normandy. You can see them in my Normandy Gallery. There are a few 108″ panoramas there. You can find lots of images like these in my galleries. My pictures can be printed in photo paper, canvas, metal or acrylic surface up to 108″ in many cases, or in greeting card format. You can check them by clicking the images above. I am all in for customizing pictures. All of them can be retouched in many ways, texts added, altered, changed or deleted. Ask freely. Es bueno leerte de nuevo. Un abrazo. This journey sounded like a wonderful experience, externally and internally. Nothing like a bit of independence, spontaneity and freedom to make you feel alive. Loved this issue — I’m inspired. Thank you . . . . nice to have you back. Thank you for reading, Faithe. My pleasure.